Alton Towers announced the arrival of a new Secret Weapon rollercoaster at the start of 2009. All anyone knew was that the ride would feature a 'world's first' element to it; and despite endless speculation and rumour across the internet it did remain a secret even whilst the ride was being built! Official planning documents were submitted in March 2009 for the ride that would replace the famous Corkscrew. These documents invited speculation that the surrounding UG Land area and Rita: Queen of Speed ride would be overhauled at the same time. Shortly after the documents were approved, construction walls went up within the area and a large marketing campaign within the park began. To keep people interested in the project, photos of construction were posted throughout the 2009-10 closed season. These included teaser images that supposedly showed the rides secret element hidden underneath banners that stated that the 'Secret Weapon' was inside! Despite the teasing, people still didn't know what to expect until the ride's opening day: March 20th 2010. On that day the world was introduced to Th13teen: the world's first vertical freefall drop coaster. 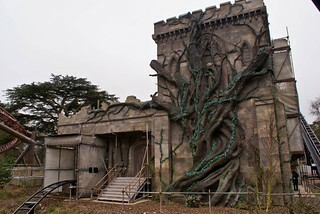 The ride's station (themed like a crypt) is located directly where Corkscrew once stood and became the centre of a newly themed area known as The Dark Forest. Media coverage of the opening was huge; featuring on TV, radio, online and just about anywhere that a press release could be seen! Stories ranged from the true to the bizarre and the ride was frequently dubbed as being the 'ultimate' rollercoaster or 'every ride you've ever dreamed of in one.' Whilst these claims were largely regarded as untrue, Th13teen was a huge success for the park bringing 3 million guests through the gates during 2010.